(Chicago) — New state funding is available to law enforcement working to divert people away from arrest and jail and into drug treatment programs. 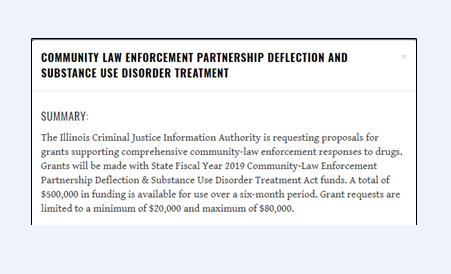 With $500,000 available, the Illinois Criminal Justice Information Authority (ICJIA) is now accepting grant proposals to support deflection initiatives in Illinois communities. Proposals are due October 25. In August, Illinois Governor Bruce Rauner signed SB 3023, groundbreaking legislation that gives police and communities a valuable tool to use in responding to drug use and addiction. The Community-Law Enforcement Partnership for Deflection and Substance Use Disorder Treatment Act provides a roadmap for local law enforcement leaders to create collaborative programs that “deflect” individuals with substance use conditions away from the criminal justice system and into community-based treatment services. The Act authorized funding to support deflection program development. “This funding demonstrates the strong commitment of the bill’s sponsors and the Governor to supporting police and communities as they work to help people gain immediate access to the substance use treatment they need,” said Laura Brookes, TASC policy director. Law enforcement agencies are eligible to apply for awards of $20,000–$80,000 for use over a six-month period during the state’s current fiscal year (January 1–June 30, 2019). They must work in collaboration with one or more treatment providers and community members to establish a local deflection program, and develop a plan to coordinate program activities with community agencies, including substance use treatment providers, medical providers, supportive services, and relevant government agencies. Based on program performance and fund availability, ICJIA may recommend allocation of funding to support programming for an additional 12 months. These five categories align with the overarching “pathways” by which police departments across the country are connecting people to community-based treatment and social services in emerging deflection programs, as identified last year by TASC’s Center for Health and Justice, and subsequently illustrated by the Police, Treatment, and Community Collaborative (PTACC), a national alliance of practitioners in law enforcement, behavioral health, community, advocacy, research, and public policy working to strategically widen community behavioral health and social service options available through law enforcement diversion. To learn more about how TASC may be able to assist with your community’s deflection efforts, contact Jac Charlier, executive director of TASC’s Center for Health and Justice and co-founder of PTACC. (Chicago) — More than 1,300 people across the country registered for a July 10 webinar offering solutions for law enforcement and justice system partners on the front lines of responding to the national opioid epidemic. Moderated by Allison Upton, senior policy analyst at the Council of State Governments (CSG) Justice Center, and hosted by CSG’s National Reentry Resource Center, the webinar, entitled “Opioid Addiction Screening and Assessment for People in the Criminal Justice System,” focuses on best practices for screening and assessing people who have opioid addictions and are in, or at risk of entering, the criminal justice system. The webinar features a review of available screening instruments and how police and other justice practitioners and first responders can select tools and strategies that work best for their programs and jurisdictions. Opening remarks were offered by Upton and Andre Bethea, policy advisor for corrections at the U.S. Department of Justice’s Bureau of Justice Assistance, which provided funding support for the webinar. 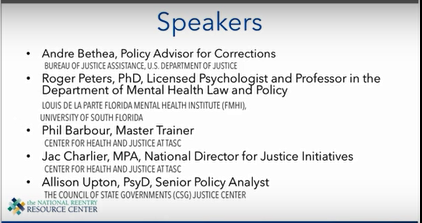 Speakers on screening tools and intervention strategies included Roger Peters, PhD, clinical psychologist and professor in the Department of Mental Health Law and Policy at the University of South Florida, as well as Jac Charlier and Phillip Barbour of the Center for Health and Justice (CHJ) at TASC. Peters offered an overview of the need for screening and assessment tools, including the high rates of opioid use disorders and the prevalence of co-occurring mental disorders. In terms of screening, there are a number of specific considerations for opioid addiction, which may include such factors as severity of withdrawal, interactions with alcohol and other drugs, the individual’s overdose history, mental health and medical issues, prior injuries and use of pain medication, risk-taking behavior, criminal justice and/or child welfare system involvement, functional aspects of use, family history, and individual strengths and skills. Given the urgency of the epidemic and the complexity of issues around opioid addiction, he noted that there are many implications for staff training in signs and symptoms of use as well as withdrawal. Barbour, master trainer at CHJ, discussed the development and use of the TCU Drug Screen 5 – Opioid Supplement, co-developed by CHJ with Dr. Kevin Knight and Dr. Patrick Flynn of the TCU Institute of Behavioral Research. The free tool can help determine earlier in the screening and referral process if there is an immediate need for services to address opioid use problems. “The TCU Drug Screen 5 screens for mild to severe substance use disorders, and is particularly useful when determining placement and level of care in a very quick way,” said Barbour. As a practical resource to help determine who needs immediate access to treatment, “it helps first responders and non-clinical personnel to implement a simpler, faster way to identify people in need of intervention for opioid addiction,” he said. “There are pathways, or frameworks, that help us understand what this newly emerging field of pre-arrest diversion looks like,” added Charlier. He described five pathways in which first responders, and particularly law enforcement, are connecting to substance use treatment and behavioral health services in communities, such as the Naloxone Plus model, a pre-arrest diversion model that rapidly connects people to treatment after an overdose. TASC’s Center for Health and Justice is the national training partner for TCU’s Institute of Behavioral Research, including training on the TCU Drug Screen 5 – Opioid Supplement. For training on the opioid supplement and other TCU resources, or for other resources for law enforcement and justice systems in responding to the opioid epidemic, contact Jac Charlier, national director for justice initiatives at CHJ. Below is an excerpt from TASC’s semi-annual News & Views. The current issue includes articles on pre-arrest, prosecutorial, and jail release interventions for people who have substance use and mental health conditions. (Chicago) — A recent criminal justice trend is gaining traction. It has potential not only to help curb the devastation that the opioid epidemic is causing in communities across the nation, but also to bring law enforcement, treatment providers, and communities together to solve common challenges that substance use and mental health disorders pose. It’s known as pre-arrest diversion. Other terms include front-end diversion, deflection, and pre-booking diversion. Regardless of terminology, the goal is the same: to divert eligible individuals with substance use and mental health disorders to treatment before logging an arrest. The first point of entry into the justice system—and thus the earliest opportunity for justice diversion—is law enforcement. According to the Centers for Disease Control and Prevention, from 2000 to 2015, nearly half a million people died from a drug overdose, and since then, mortality rates have climbed precipitously, with a record 64,000 people having lost their lives to overdose in 2016. Often at the front line of these tragedies, local law enforcement agencies are seeking new ways to better serve and protect communities confronting the consequences of substance use disorders, especially as police frequently interact with individuals affected by addiction and/or overdose. Pre-booking or pre-arrest diversion strategies can help reduce drug use, promote public safety, and save lives. In March, the Center for Health and Justice at TASC partnered with the Civil Citation Network to convene the first-ever national summit focused on pre-arrest diversion. Criminal justice, behavioral health, and public policy experts from across the country gathered at the headquarters of the International Association of Chiefs of Police (IACP) in Alexandria, Virginia, for two days of information sharing and planning. From this meeting emerged the Police, Treatment and Community Collaborative (“PTAC Collaborative”), the first national effort to build a multi-disciplinary approach that ensures law enforcement, treatment professionals, and community members collaborate as equal partners to widen community behavioral health and social service options available through law enforcement diversion. Working through the PTAC Collaborative, IACP and TASC have come together to promote alternative-to-arrest diversion programs for state, county, and local law enforcement agencies across the United States. This collaboration seeks to greatly improve the means, ease, and speed with which law enforcement can partner with substance use and mental health treatment providers so that police can help people access treatment. Read more about TASC’s partnership with IACP and the PTAC Collaborative to advance pre-arrest diversion. Save the date for the inaugural PTAC Collaborative conference March 4-7, 2018 in Ponte Vedra, Florida. 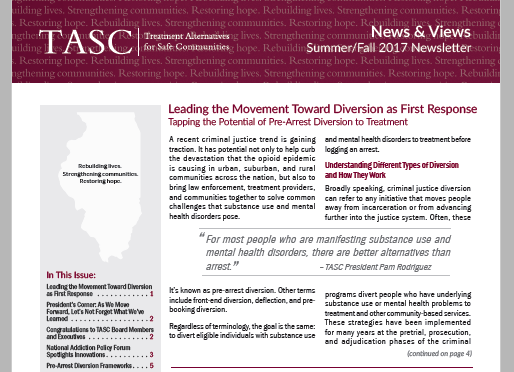 Browse additional stories in the current issue of TASC News & Views, including frameworks for pre-arrest diversion (p. 5), prosecutorial diversion in Illinois (p. 6), and the new Supportive Release Center in Cook County, Illinois, where TASC and partners provide intervention and service linkages at the critical point of release from jail (p. 7).